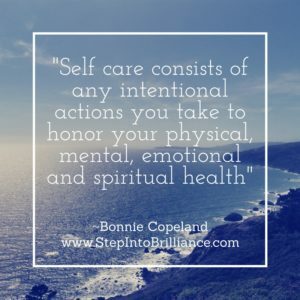 Self care needs to be purposeful! Yes, yes I know I’ve said that before (a few hundred times) and yet there are some folks out there you have heard it – but clearly don’t get it. How do I know? Simple, because they are not living it. Too many folks are half-assing it, forgetting about it or not prioritizing it and then wondering why self care doesn’t help them. So I’ve decided to share with you some of the very simple ways I manage my own self care. These are a few of my daily habits that keep me feeling balanced. Now I want to be really clear, sometimes I really have to hustle to make it happen which might sound counter-intuitive to self care but it’s not. It’s making it a priority in my life. Please don’t tell me you don’t have time. That’s total BS and you know it. You simply are not choosing to put your energy into self care. Listen, occasionally, I will have to let something else go in order to make these things happen. For me, TV was the first place I clawed back some time. Truth is, I can’t remember the last time I watched it. It’s rather amazing how much extra time suddenly showed up! I know some days are going to be super busy, so I will prepare meals ahead or cook extr a for left overs. I try to do things the night before that can shorten my ‘get ready’ time like preparing the coffee, or figuring out what I’m wearing so I’m not searching all over. It does take some thinking, choosing and planning (hence the ‘on purpose’ bit right?) but eventually it gets much more streamlined. In the descriptions below you’ll get an idea of how I often simply had to shift how I viewed things, adjusted and how things evolved over time. So, let’s peel back the curtain shall we? I journal every day. I get up an extra 15 mins early and sit in my comfy chair with my cup of coffee and write. And guys, for real – I am NOT a morning girl so if I can do this – anyone can! I say a morning invocation and set my day’s intentions to be curious, kind and open to learning. This starts my day on a really lovely footing. I practice mindfulness with my dog. Now don’t laugh, I’m serious! Listen, he needs to be brushed every day or my carpet changes colour. (light carpet, black dog…good times!) So, I make it a point to be really present with him. It’s a special time that we both love…distractions not included. We usually do this in the evening after our walk and dinner. It’s quite nice to start winding down this way. I have a practice of 30 mins of reading every day (at least lol). Now I’ll be honest, this was a struggle for a while because sometimes after a busy day it’s hard to focus on the page. Especially with all the chores of the day waiting for me (seriously, where does one get a butler?). However, I found that audio works really well for me too. I often combine listening to books with mindless chores like doing the dishes or folding laundry. I make it a point to have at least one really healthy, yummy meal every day. I mean, sure all my meals could be that way, but it’s a must to have at least one. Why just one? Because I’m realistic about who I am. I get busy, I’m on the go, and I occasionally need to visit a store in order to have food in the house. For example, cereal for breakfast might do the trick, but it’s not super healthy or super yummy. Once it gets feeling easy to have one, I’ll up my requirement to 2 meals a day. Now these are just of few of my daily habits that support my life balance. Your habits might be quite different. I have developed these self care habits because they help me feel connected, supported and expansive. Next week I’ll share some of my weekly self care routines and you can see the difference from daily ones. P.S. For more about Life/Work Balance be sure to grab my new report (with quiz) off my website. It’s FREE! Ohhh, I love that Charlie is part of your self-care routine. Brushing time sounds PERFECT! A great list of ideas…. Great advice, and I love how you tell it like it is! No sugar-coating😉 This really is something everyone can do. Thanks, Bonnie!